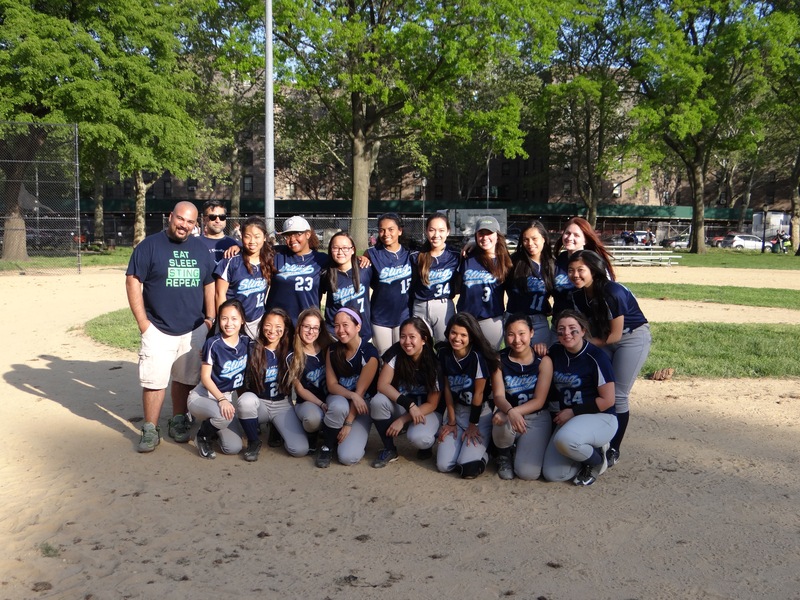 This year, BSGE’s varsity softball team had their longest and most exciting playoff run yet. During the regular season the team was undefeated, finishing 15-0 in their PSAL Queens B Division, led by captains Nina Don ‘16 and Rakia Islam ‘16. Lady Sting was seeded #1 in Queens, and was given a first round bye. In the second round, the team defeated Robert H. Goddard High School 10-9 in a 6-run seventh inning rally. BSGE was then granted the overall #3 seed in the city out of the remaining 16 teams. After beating Sunset Park High School 8-1 in the third round, Lady Sting advanced to the quarterfinals for the first time in BSGE history. Despite losing 3-0 to the High School for Math, Science and Engineering, Lady Sting still finished the season as one of the top 8 teams out of the total 133 in B Division softball, an accomplishment that the players, the coaches, and the many spectators and fans are truly proud of. For the eight seniors on the team, who have played a huge role in Lady Sting’s development over the past four years, the playoff push was a great end to high school softball. “It’s been a great run, but I’m very sad because these girls have been my family for the past 4 years,” explained Peyton Heron ‘16. “I’ll miss the bond we have, but because we have pride in ourselves we are always going to stick together. Lady Sting Pride!” Catcher and co-captain Rakia felt similarly. “It was our greatest season yet,” she said. “I’m very proud of everyone. It was a lot of fun, but I’m sad to be leaving.” Coaches Virge Ramos and Aly Lakhaney were excited about the team’s success this year. “It was a great season,” Coach Ramos said. “It was the first time in BSGE history that we made it past the second round. I am proud of each and every player.” On a personal note, I know I will miss my four years with this organization very, very much, and I am honored to have had the chance to play with such a dynamic, hardworking group of girls. ‘Til next season, Lady Sting! Next Post Thanks BSGE PTA!